Not, perhaps, the face modern eyes would immediately think of captivating an emperor, but this porcelain plaque portrait of Napoleon’s first wife, Josephine, was one of a number of major attractions at Canterbury Auction Galleries’ (24% buyer’s premium) Spring Sale. 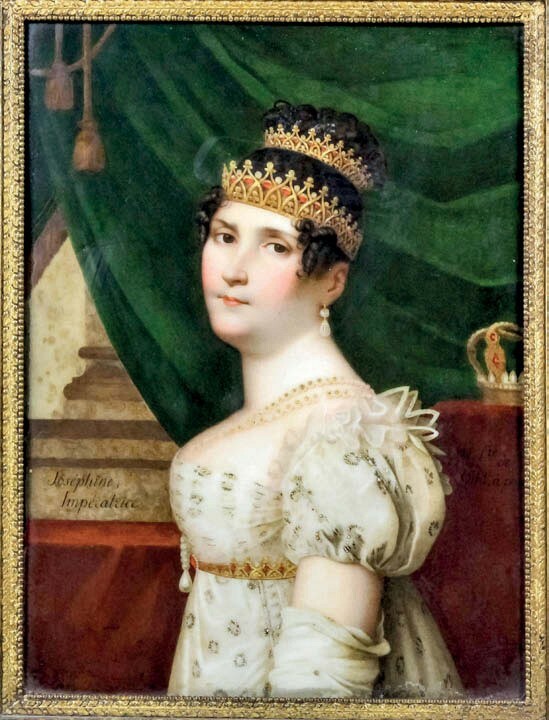 Porcelain plaque portrait of Napoleon’s first wife, Josephine, sold at Canterbury Auction Galleries for £7200. Based on a c.1809-14 miniature by Ferdinand Paul Louis Quajila, the 8½ x 5½in (21.5 x 14cm) plaque, was signed M. fre de Dihl a Paris – one of the high-quality hard-paste pieces created by the factory set up in Paris in 1781 by Christophe Dihl (1752-1830). Provenanced, thanks to a 19th century paper label, to a Christie’s sale in 1869, the plaque in an ebonised frame with gilt metal inner slip was pitched at £5000-7000 at the April 10 sale and sold at £7200. Dihl enjoyed a degree of royal custom and survived the Revolution but, having staved off bankruptcy by taking huge loans in 1807 and 1809, he closed the factory in 1828 and died a ruined man in 1830.